Shark fishing with Dream Catcher Charters. Sharks are a key species in the survival of everything in the ocean. The clean up crew, sharks kill off and eat the weak and dying to ensure the survival of a species and to separate the sick from the healthy. Although we fish for sharks and have a lot of fun catching them, sharks are released unharmed. 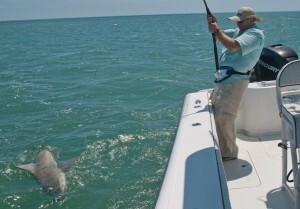 Catch sharks… Up to 600 lbs is not impossible or uncommon here in Key West. Many are surprised how many sharks we have here in Key West. We fish for bull sharks, lemon sharks, hammer heads, American sharp nosed, black tips and the rare tiger shark. Shark fishing charters depart daily and can be combined with other fishing charters we offer such as tarpon fishing and backcountry fishing. We offer 4, 6, and 8 hour shark fishing charters for up to 6 persons. Our shark fishing charters here in Key West offer the best in an experience of this nature as you can find. The finest tackle from Daiwa reels, The nicest boats from Yellowfin Yachts and a sight fishing environment rivaled by none..
You need to bring a hat, sunscreen, whatever you like to eat or drink outside of water. The best thing to do is call our office and let us help you plan the best shark fishing charter you can get here in Key West. This is what we do.